Most Overseas Filipino Workers (OFWs) who have worked abroad for a long stretch want to go straight home from the airport. This was not the case for 40-year-old Renante Bendaña, a Sales Support Engineer with a steel construction company in Jeddah. 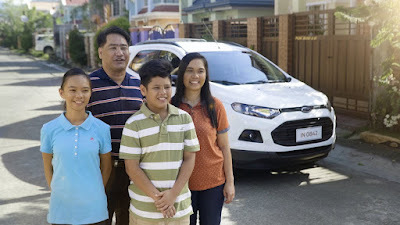 After his 15-hour flight last December, he went straight to the Ford Cainta dealership to purchase his first family car, a gift for his loved ones he had saved for after years of working hard overseas. There are over two million OFWs around the world, according to the Philippine Statistics Authority. While everyone has a different story to tell, most - if not all - have one goal in mind: to provide a better life for their families, much like Bendaña. Bendaña first tried his luck abroad in 2005 with his wife Lucy. In 2013, Lucy chose to return home to take care of their children, Yuxia, and Sean, who were aged 8 and 7 at the time. In 2016, the family decided to purchase a car to help Lucy with the daily grind of being a hands-on mother. As luck would have it, while searching for the perfect car Bendaña learned of the Ford OFW Assist Program. Reading through the Ford OFW Assist Program, Bendaña discovered the ease of this online and hassle-free process that allows Filipinos working abroad to buy a Ford vehicle in the Philippines. The Program also offers a flexible financing initiative exclusively to OFWs. Bendaña admitted that he was initially interested in the Ranger, but when he saw the EcoSport, he knew immediately that it was perfect for his family of four. Lucy had just gotten her license a couple of days before they took the EcoSport home, so she was a little nervous. But when she got in the driver’s seat, she instantly felt comfortable. It was bought for her after all, and she knows that once her husband goes back to Jeddah, it’s her new baby, so to speak. Grateful for the service he received from the Ford OFW Assist Program, Bendaña recalled how he was pleasantly surprised by the convenience of the online platform and the attentiveness of Marty Zaballa, a Sales Consultant at Ford Cainta for three years. “In less than a day, I got a response from Ford. I knew then that they were very attentive to our needs, especially Marty. He was focused on handling our papers and he really made the process a lot easier. You can see his will and desire to help us achieve our dream car, and for that I am very much satisfied,” said Bendaña. Bendaña said his fellow OFWs would joke that since he’s the first one to go back home, he should be the first to test the Ford OFW Assist. “My friends and I were all interested in Ford’s program. We had our doubts at first given that it’s our hard-earned money, but I’m glad I went after the opportunity. I can now confidently attest to the Ford OFW Assist program. Napakaganda at naramdaman ko talaga, na ako, bilang isang OFW, ang bida dito. (It’s really nice and I felt that as an OFW, the program was made especially for us),” said the new EcoSport owner. For someone who is also working away from his home country, Ford Philippines’ Managing Director Lance Mosley expresses passion for the program. “It’s humbling to hear the many different stories of our OFWs. They have given up a lot to provide a better future for their families, and Ford acknowledges this. Through the OFW Assist Program, we’re helping these brave men and women purchase a dream car that is earned through the hard work of these OFWs and the unconditional love they have for their families,” said Mosley. Designed to make the process convenient for OFWs, the program has a variety of exclusive services. Apart from the dedicated customer-service hotline, OFWs can conveniently book a test drive for family members in the Philippines. The platform also offers an easy EastWest Bank online loan applications for Ford vehicles.